What’s That in the Sky? Check Out the Lyrid Meteor Shower this Earth Day! It’s one of our favorite days of the year here at Dreams Resorts & Spas: Earth Day! What better way to celebrate this great holiday than by checking out one of Earth’s greatest wonders: a meteor shower! The Lyrid Meteor shower occurs every April and tonight promises to offer one of the best views of this annual, dazzling natural wonder! We recommend gathering your family and friends, finding a safe, dark spot on the beach or the terrace of your room or suite and trying to steal a glimpse of a Lyrid Meteor! More of an early riser? Sunrise is also an excellent time for viewing! Dreams Resorts & Spas provide the ultimate fun-in-the-sun escape for families, couples and singles. Each of our extraordinary destinations features pristine beaches, an international array of gourmet restaurants, and activities for every age and interest. Best of all, most every amenity is included as part of Unlimited-Luxury®. 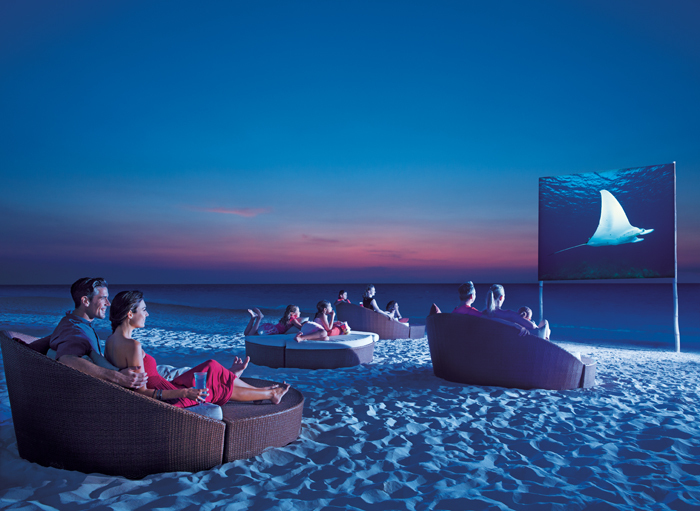 Guests enjoy a movie under the stars at a Dreams Resort & Spa. We can’t think of any better way to celebrate Earth Day! Won’t be able to join us this time? Don’t worry! Don’t miss our Unlimited Air Credit special offer (ending April 30) and get $50 air credit per room, per night when you reserve your stay at any Dreams Resort & Spa by April 30, 2015 for travel from February 25, 2015 to August 21, 2015. Plus, up to 2 kids stay free when staying in the same room as two paying adults for travel from May 1, 2015 through December 23, 2015! Book your next Dreams escape and we’ll catch the next meteor shower with you! This entry was posted in Dreams Resorts & Spas and tagged Activities, beach, Earth Day, meteor shower, special offers, unlimited air credit. Bookmark the permalink. Celebrate Your Love at Dreams Resorts!